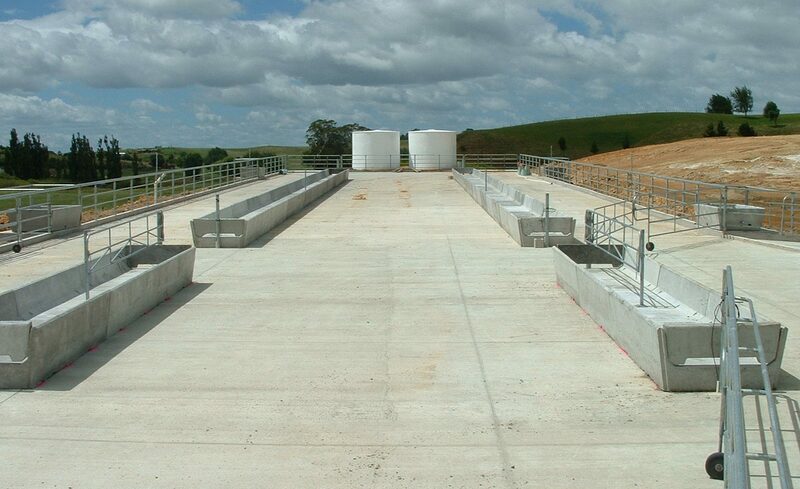 We construct feed pads, either in conjunction with a new farm dairy, or to fit to existing dairies. Siting is important for a number of reasons; cow comfort from inclement weather, stock flow to and from the farm dairy, effluent disposal, and proximity to stored feed. The design of the feed pad should provide room for all cows to easily access feed bins. They should also provide adequate room for machinery to move around the feed bins for feed delivery and pad cleaning. Water troughs and high pressure water outlets for washdown also need to be provided. Concrete slabs for feed pads need to be heavy duty reinforced concrete to allow for the extreme loadings placed on them by heavy feed wagons. We have designed and built many styles of feed pad, and can advise on how best to integrate a feed pad into your farm layout. If you’re after a more practical and versatile feed pad, take advantage of our vast experience and contact Chapman Dairy™.